The Jet 3 Ultra delivers superb close-quarter maneuverability, sleek styling and high-performance technology all at a great value. 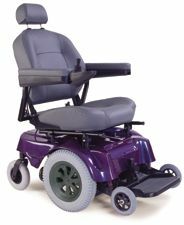 This upgraded model has all the great features of the larger Jazzy's, such as Active-Trac suspension, new easy access battery design, trapeze bar seat mount for quick adjustability. This unit comes standard with a full recline, super high back seat, that allows the user complete comfort at any time. In addition, the Jet 3 Ultra offers an on-board battery charger and comes complete with elevating leg rests.